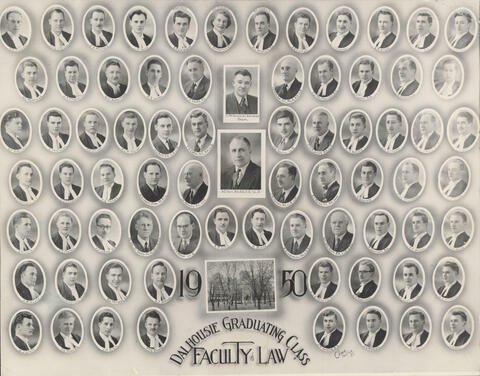 Item is a composite photograph of the 1950 graduating class and faculty of the Dalhousie University Faculty of law. 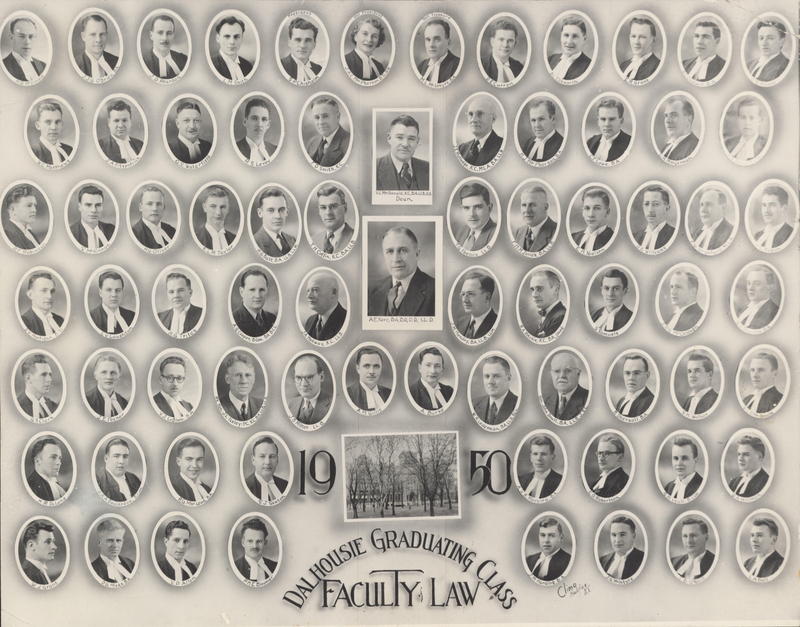 The photograph consists of portraits of H. B. McDonald; J. J. G. O'Brien; J. D. Reardon; L. M. Smith; S. P. Chisholm (President); J. A. C. MacPherson (Vice President); M. L. McIntyre (Secretary Treasurer); D. E. Curren; D. C. Ellsworth; E. R. Grant; A. L. Caldwell; C. W. Moore; W. C. Matthews; J. A. Fitzpatrick; G. S. Waterfield; J. S. Levey; F. D. Smith; V. C. MacDonald (Dean); J. E. Rutledge; H. J. MacPherson; C. T. Lowe; C. H. MacLellan; R. F. Robinson; S. McKinnon; H. G. Oliver; K. L. R. Taylor; H. G. Batt; T. H. Coffin; A. E. Kerr; T. G. Feeney; F. H. M. Jones; E. H. Nielson; D. B. Williams; E. W. Urquhart; Regan; D. V. Hartigan; C. V. Laughton; A. G. Trites; A. G. Cooper; J. A. Hanway; J. M. Hendry; R. A. Ritchie; S. Samuels; J. P. G. McColough; W. S. Pearson; G. S. Clark; J. E. Feener; V. J. LeBlanc; J. L. Ilsley; J. B. Milner; A. M. Gillis; A. Burke; W. R. Lederman; John Doull; B. Sherwell; S. H. Wallace; W. C. S. MacDonald; H. R. DeLong; A. A. A. Baccardax; R. G. McLeod; S. J. Sexton; A. W. R. Moreira; C. D. Robertson; R. H. Lyall; W. A. Hillman; W. J. Grant; D. G. Hicks; V. P. Allen; P. H. E. Bloomer; J. M. Harding; J. G. McIntyre; T. B. O'Neill; and L. A. Bell arranged in seven rows around a photograph of a building. Corners of photograph are bent. Photograph is faded.